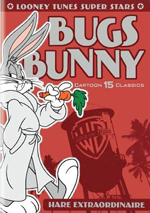 Looney Tunes Super Stars: Bugs Bunny - Hare Extraordinaire is a DVD of 15 new-to-DVD Bugs Bunny cartoons. 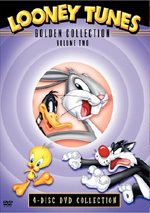 None of the cartoons are found on the Looney Tunes Golden Collections; along with Daffy Duck: Frustrated Fowl, these two DVDs are the successor to the Looney Tunes Golden Collection series. 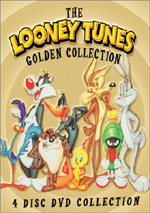 To date, most Bugs Bunny cartoons have been available on DVD via various Looney Tunes compilations. Fans who want the Bunny and nothing but the Bunny get gratification via Looney Tunes Superstars: Bugs Bunny, a package of 15 shorts previously unreleased on DVD. Mutiny on the Bunny (1950, Friz Freleng): Cruel ship captain Shanghai Sam – nee Yosemite Sam - needs a crew, and he cons Bugs into becoming his sole employee. The scenario provides a smattering of laughs, but the comedy feels a bit perfunctory. 6/10. Bushy Hare (1950, Robert McKimson): Due to a mix-up, Bugs ends up placed as the baby of a mother kangaroo and must fight off a vicious aborigine eager to attack. If nothing else, “Hare” gets points for its absurd scenario; the idea of “Baby Kangaroo Bugs” is odd enough, but the manner in which he finds himself in Australia is even goofier. The aborigine character isn’t particularly memorable, but the short musters good entertainment. 8/10. Hare We Go (1951, Robert McKimson): Columbus attempts to prove that the world is round, and Bugs goes along for the ride. Two shorts after “Mutiny”, it might be a little soon for another with a nautical theme, but “Hare” delights so much that I don’t care. It’s a nice little historically-oriented romp. 9/10. Foxy By Proxy (1952, Friz Freleng): Bugs ends up in the middle of a British fox hunt and toys with a not-so-bright hound. I appreciate the anti-hunting message semi-implicit here, but the short itself doesn’t have a ton going for it. Bugs’ foe is so stupid that his antics seem meaner than justified. It would’ve been better if Bugs fought a wily foe, not a dopey one. 5/10. Hare Trimmed (1953, Friz Freleng): A widow inherits megabucks, and Yosemite Sam plans to scam her; Bugs comes to the rescue. It’s nice to see Bugs stand up for someone else – he usually fights a foe for his own bemusement, it seems – but the short doesn’t really muster a lot of amusement. A few good gags emerge, but nothing especially memorable occurs. 4/10. Lumber Jack-Rabbit (1954, Chuck Jones): Bugs ends up in Paul Bunyan’s garden; he chows on giant carrots and spars with Bunyan’s watchdog. The Bunyan theme sets up interesting options, but the short doesn’t explore them well. It makes Bunyan’s dog just another in a long line of fairly interchangeable Bugs foes, and the pooch doesn’t stand out as impressive. 5/10. Napoleon Bunny-Part (1956, Friz Freleng): While digging a hole, Bugs manages to travel through time and ends up in Napoleon’s court; there he tweaks the little tyrant. That’s kooky, though I guess it’s no weirder than the Paul Bunyan or Christopher Columbus shorts. Its comedic impact ends up between those two, though. Some parts of this short delight, some fall flat, but it’s generally pretty good. 7/10. Bedevilled Rabbit (1957, Robert McKimson): Bugs ends up in Tasmania, where he battles the Tasmanian Devil – natch. This was Taz’s second appearance; 1954’s Devil May Hare launched the character. I can’t say Taz ever did a lot for me, but he works fine in this short; even while it trots down some predictable paths, it amuses. 8/10. Footnote: early in the short, Bugs mutters “wha’ hoppen?” I can’t help but wonder if this line inspired Fred Willard’s fake catch phrase from 2003’s A Mighty Wind; Willard tosses out the comment with virtually identical diction, so I find it hard to think it’s a coincidence. Apes of Wrath (1959, Friz Freleng): A drunk stork loses a gorilla baby and delivers Bugs as a replacement. Shades of Kangaroo Baby Bugs! It features a gorilla couple, not just a mommy, and the mother speaks, so it’s not a clone. However, it’s somewhat uninspired, though a surprise cameo at the end adds punch. 5/10. From Hare to Heir (1960, Friz Freleng): Though royalty, Sam runs out of money. Bugs promises him a new fortune if only he can control his temper. Battles between Bugs and Sam go back years, but the latter’s need to restrain himself makes this one more delightful than usual. 8/10. Lighter than Hare (1960, Friz Freleng): Spaceman Sam invades the earth and sends robots to abduct a rabbit – one specific rabbit, that is. It’s a bit odd to see a space-oriented short without Marvin the Martian, especially since that character came into existence 12 years earlier. I don’t know why they went with Sam here, but it’s a weird choice that doesn’t work. This never becomes a bad short, but it’s uninspired. 4/10. The Million Hare (1963, Robert McKimson): Bugs and Daffy race to win a prize from a TV game show. How does Beat Your Buddy get an audience? It’s not The Amazing Race - the cameras don’t film the “buddies” as they race to the studio. Is it an hour of the host as he sits and waits? Despite that flaw, “Hare” entertains. Of course, it follows a predictable construction, but the gags prove to be clever. 8/10. Mad as a Mars Hare (1963, Chuck Jones and Maurice Noble): “Astro-rabbit” Bugs ends up in space, where he battles Marvin the Martian. Despite some quirky twists, this one lacks much punch. I may have thought he made sense for “Lighter”, but Marvin’s never been a favorite, and he adds little here. 5/10. Dr. Devil and Mr. Hare (1964, Robert McKimson): Bugs impersonates a doctor to torment Taz. Even in a world of wacky premises, the way this one moves gives it an unusually strange quality. That “anything goes” tone – during which Bugs goes from general practitioner to psychiatrist to nurse to surgeon in rapid succession – offers good energy. Taz is more entertaining than usual as well, and this becomes a winner. 9/10. False Hare (1964, Robert McKimson): The Big Bad Wolf and his nephew create a fake “rabbit club” to snag Bugs. They fail. They also don’t manage to muster immense comedy, as the situations lack great bite. Still, it’s a decent short, and another fun cameo at the end adds a little value to it. 6/10. Looney Tunes Super Stars: Bugs Bunny appears in an aspect ratio of 1.33:1 for its first five shorts; after that it goes to a 16X9 enhanced aspect ratio of 1.85:1 on this single-sided, double-layered disc. I’m glad that we get the widescreen shorts in their original aspect ratios, but the quality of the cartoons could often leave a lot to be desired. Sharpness was generally positive. Occasional instances of softness occurred, but those weren’t significant; instead, the shorts usually appeared pretty concise and distinctive. While I noticed no prominent examples of shimmering or jaggies, digital artifacts could present problems. Especially in the widescreen cartoons, I noticed a fair amount of mosquito noise, and other concerns appeared. Source flaws were another issue, though they varied quite a lot. Some shorts appeared reasonably clean, while other seemed rather dirty. I would see prominent dust, specks, marks, scratches and other defects. Again, these didn’t appear constantly, but they created distractions for the majority of the material. Colors looked decent, though the flaws affected their impact. With dirt and digital artifacts on display, the hues came across as less vibrant than they should have. The tones still managed reasonable clarity, but they rarely stood out as very good. Blacks were fine, at least, and shadows showed acceptable definition. Though these shorts remained watchable, they really could us a good clean up. While more consistent, the monaural audio of Bugs wasn’t particularly strong. Still, I didn’t expect wonders from 46 to 60-year-old mixes. Speech could be a bit edgy at times, but the lines usually demonstrated good clarity, and no problems with intelligibility occurred – or at least not unintentional intelligibility, as some of the voices were supposed to be tough to comprehend. Music was a big part of the tracks, and it seemed fine. Though the scores lacked much heft, they gave us reasonable reproduction of the material. Effects occasionally became a bit rough, but they mostly offered positive clarity and accuracy. No issues with source noise cropped up along the way. Given the age of the shorts, the tracks were average. Bugs Bunny remains one of the all-time great cartoon characters; it’s possible only Mickey Mouse is more famous, and Bugs is significantly funnier than Walt’s rodent. Looney Tunes Super Stars: Bugs Bunny doesn’t offer a consistently excellent roster of shorts, but most are good, and even the “stinkers” manage some entertainment. Unfortunately, the disc itself seems lackluster. Audio appears fine for its age, but picture quality suffers from a mix of flaws, and we get no supplements. 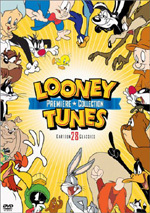 With two hours of good cartoons, it’s going to appeal to a lot of Looney Tunes fans; while the disc’s drawbacks affect my recommendation, I still think its entertainment value and low price make it worthwhile.